What does being multi-passionate mean? It means I've never been very good at doing one thing. When I was a kid I wanted to be an archaeologist, and a palaeontologist, AND an artist. In high school when I took career aptitude tests I was always disappointed with the results because I inevitably started thinking about all the interesting exciting careers that weren't contained in that one job title. I am usually reading at least three books at any given time - often on wildly different subjects. In university I majored in drama and I started with the goal of becoming an actor. Then I took a class about set design and fell so deeply in love with it that I was convinced it was my ideal job. But when my counsellor suggested that I apply for the BFA in theatre design and focus on that exclusively, I was overcome with resistance. "But then I wouldn't be able to act at all," I thought. "Or learn to direct, or write plays. And what about physics classes and African history?" I couldn't bring myself to give up all the other interesting stuff that I was learning about and experiencing. I couldn't imagine focusing on one thing and one thing only. I never regretted my decision because I found that trying out many different disciplines at once allowed for plenty of cross-pollination and resulted in ideas that I never would have had otherwise. I loved switching hats throughout the day - creating characters and writing words for them, designing and building new worlds, coaching actors and using my vision to help inspire them. I felt endlessly challenged and satisfied. To this day, my mind frequently changes, I try new things, I go in different directions. And I'm okay with that - though it took me a long time to get there. I used to feel ashamed of the fact that I enjoyed so many things and never felt the pull of one tremendous passion. I used to think that my career and happiness were doomed because of it. Now I embrace it and I've figured out some systems that help me to do all the things I'm interested in, while still feeling productive and focused. Read Refuse to Choose by Barbara Sher. If you're overcome by overwhelm or guilt at your inability to focus on one thing, you need to read this book. In it, Sher describes a certain type of person called a "Scanner": someone who is constantly scanning the horizon for the next thing. She goes to great lengths to explain that this type of behaviour is okay and that there's nothing wrong with you. She spends the rest of the book describing different types of scanners and techniques for dealing with overwhelm and making the most of your multi-passionate tendencies. I highly recommend it. Keep a record of all your ideas and plans. Since you will inevitably be knees-deep in one project when you get an idea for the next one, make sure you write down or sketch out your next idea, and do it somewhere you know you'll be able to find it again. I keep a small notebook just for writing down all the random thoughts that pass through my mind, and I look at it once a month or so to help me decide what I want to focus on. Also, my 'For Later' list on our local library's online system is constantly growing with books I want to read. On the rare occasion when I have nothing to read, I turn to that list. You don't have to choose for forever. But you do have to choose for right now. You can do and be a multitude of things in a lifetime, but in the present moment you can only do one thing. Set up systems that help you decide when it's time to move from one passion to another, whether it happens hourly, weekly, or yearly. I have so many creative project ideas floating around in my mind but I know I can only give my full attention to one thing at a time. Right now I'm doing papier mache. In a couple weeks I'll switch to block printing, and after that, who knows! Make your decisions by acting, not by thinking. If you don't know which idea to start on it's best not to wait until you feel more pulled to one or the other, or until the choice seems clear in your mind. As Marie Forleo says: "Clarity comes from engagement, not thought." I would suggest choosing something - anything - and jumping right in. You'll soon know if it's something you want to continue putting energy into or if you would rather move on to the next thing. Once you've made a decision do whatever you need to do to stick to it. Overwhelm becomes a problem when we widen our view too much. If you know that all your other ideas are safely tucked away you can put the blinders on and focus on the task at hand. When I was helping my dad move I kept feeling overwhelmed by the amount of stuff there was to pack. My boyfriend had to remind me to take it one box at a time and to focus on that one box instead of trying to pack the whole room at once. Do that with your ideas. Narrow your vision down to one task and stick with it until either it's finished or you consciously choose to switch gears. That doesn't mean you can't jump from one project to another, but it needs to be done consciously and with attention - not because your mind wanders. I schedule my day with various projects in mind and allot time for each. There are many reason for not finishing something, or for switching directions. Sometimes it's because it's just not what we thought it was (like theatre for me). Sometimes we go as far as we want in something and aren't feeling challenged by it any more. Sometimes, however, we get to the part that doesn't feel as exciting, doesn't feel as rewarding, doesn't go smoothly. It gets hard and we start to wonder if we're cut out for this and if we should just give up. In my mind, there's nothing wrong with leaving a project unfinished as long as we're leaving it for the right reason. If it's your dream to knit a sweater and you accomplish that goal but have no desire to knit after that it's perfectly fine to lay aside the needles and look for something else. Just don't quit halfway through the sweater because it's boring or hard and you think that crocheting would be a lot more fun. If you realize partway through that you actually hate knitting, that's a different story. If it's not filling you up and you would rather put your time elsewhere, that's fine. But don't let the allure of something new stop you from putting in your best effort and pushing through the hard part. Getting through the hard part really is the best part. What do you think? 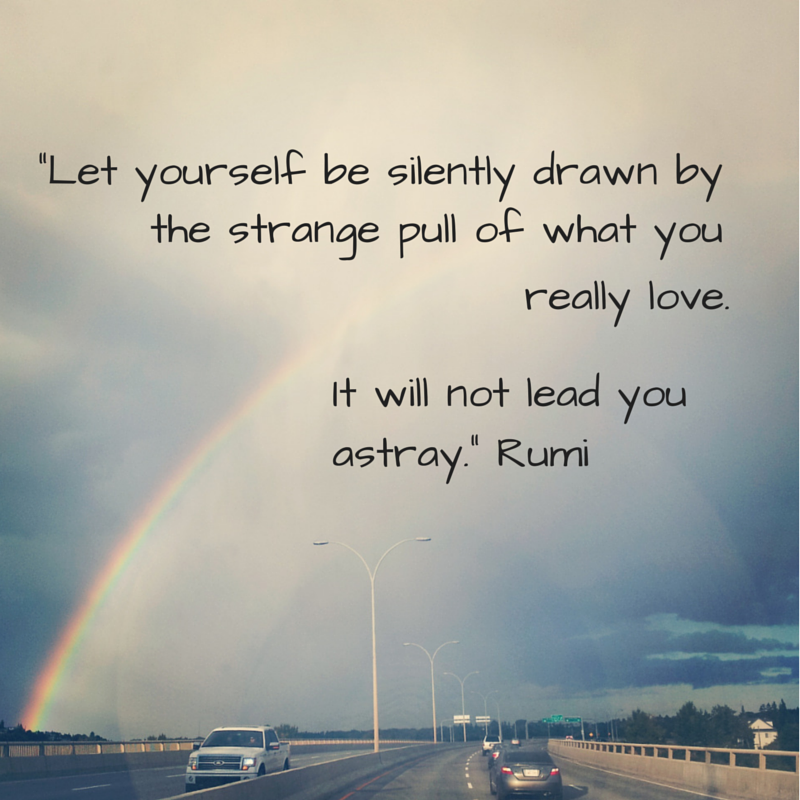 Are you multi-passionate and find yourself pulled in many directions at once? Do you find it to be helpful, or a hindrance? Leave a comment below!